A variety of outside seating, feel free to bring your own lunch/beverages! Welcome to Lane Lodge B&B Doolin! 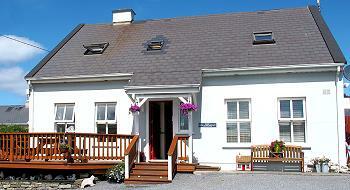 Lane Lodge Bed & Breakfast Accommodation in Doolin Village overlooks the Atlantic Ocean on "The Wild Atlantic Way". This comfortable and cosy accommodation offers you a warm friendly welcome with complimentary tea/coffee at all times. Your host Teresa, a native of Doolin will be happy to help plan your day and provide maps and the best advice on the area to make your visit a memorable one. We offer free Wi-fi and secure on site parking, TV"s and toiletries are provided in rooms. Lane Lodge B&B is situated in Fisherstreet, in the heart of Doolin village near the shores of the Atlantic Ocean and is only 2 minutes walk from Gus O'Connor's Pub, famous for its Traditional Irish Music sessions. Many other of Doolin's pubs as well as restaurants are in walking distance. Several tables around the house are perfect for the warm days, you're free to bring your own lunch and beverages for a picnic! We're conveniently located for trips to the Aran Islands and the cruises of the Cliffs of Moher, the new pier can be reached on foot without the hazzle of finding a safe parking spot. The Doolin/Moher Cliff walk commences not far from where we are, packed lunches are available. Further activities include surfing, horse-riding, golfing, caving - to name but a few. Please have a look through the following pages to find out more about our B&B!